Since the bicycle's invention in the early 1900s, it has been a favorite form of recreation and sport in the U.S. More than 100 million Americans enjoy biking, either for recreation or, increasingly, for commuting to work each day. While a great workout for most of the body, feet play a vital role in cycling. They are responsible for the transfer of energy from the body to the pedals, which makes the bicycle move. 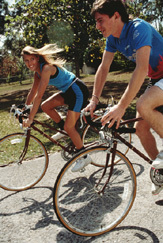 Keeping the alignment between the hips, knees, and feet is the most efficient way to operate a bicycle. Lack of proper body alignment and overactivity are responsible for the most common foot problems related to biking: Achilles tendonitis, sesamoiditis, shin splints, and foot numbness or pain. For the casual or recreational cyclist, a typical athletic shoe used for running, walking, or cross-training is perfectly fine for biking. Just be sure that the sole is firm and not worn down so that it grips the pedal to avoid slipping. For more serious cyclists, next to bicycles themselves. proper shoes are the most important piece of cycling equipment. In general, cycling shoes should have a stiff sole and fit snugly around the bridge of the foot and heel. The more stable and less movement inside the shoe, the more power can be transferred through the entire foot to the pedal. Also look for shoes with ventilated uppers to keep feet more comfortable. Closure systems vary, including lacing, buckles, straps, and Velcro -- or some combination. You can choose whichever feel most comfortable to you. However, be careful that any loose ends (from straps or laces) and buckles don't hang over, as they can pose a safety hazard if you elect to use toe clips. The type of biking you do can impact your choice of shoes as well. For road cycling and racing, shoes that have stiff soles, a narrow heel, and snug fit are best. For mountain biking, the shoes also need a decent tread for better grip and a more rugged sole. Many serious cyclists use some form of a toe clip system. These allow the rider to transfer power from the body to the pedal in both the up and down motions of the leg. Simple toe clips have metal or plastic clips that attach to any type of shoe with strapping. However, they are not as efficient at energy transfer because they allow the foot to bend. Additionally, hanging straps can pose a danger. Clipless systems use metal or plastic cleats in the sole of a shoe that attach to bindings on the pedal. These are a good choice for road or race cycling, but they do take some adjusting to initially. Also, the cleats make the shoes unwearable for walking. Clips are generally not advised for mountain biking since the foot comes off the pedal frequently. Remember to take the socks you plan to wear with you when trying on cycling shoes to make sure the fit is right.